Iowa Barnstormers prepare to defend their Indoor Football League crown. Predicting the outcome of a 14-game football season before the first snap has been taken is akin to sending an e-prayer via Facebook. While the intention may be good, in reality, it’s useless. The same can be said for football prognostication. Sometimes, as the football gods would have it, Hope Boulevard and Aspiration Avenue refuse to intersect. Players get injured, bounces go the wrong way, coaches make the wrong calls, and Lady Luck is nowhere to be found. 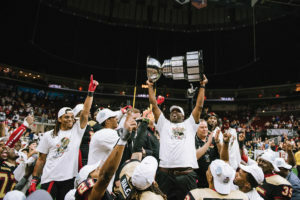 As he begins the 2019 Indoor Football League indoor gridiron campaign at the helm of the defending champion Iowa Barnstormers, head football coach Dixie Wooten knows this as well as anyone. Predicting success is easy, but making it actually happen is something else. The coach controls what he can, and the rest will be what it will be. The pieces of the championship puzzle are many, and bringing it together in order create a clear and cohesive picture is difficult. The question now is, can the Barnstormers do it again? The positive-thinking Wooten believes it can. Being the “king of the hill” is new territory for the team, but it’s a place he and the squad are relishing and have no plans for descent. The 2018 championship banner that will soon hang from the rafters of Wells Fargo Arena is a 24-year project that’s stitched with the blood, sweat and tears of franchises past, beginning with the original Iowa Barnstormer Arena Football League team in 1995. 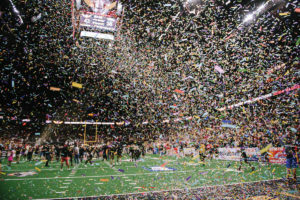 Since then, the Barnstormers — in varying iterations over the years in the Arena Football League (AFL), Arena Football League 2 (AFL2) and the Indoor Football League (IFL) — have managed to capture three conference championships (1996, 1997, 2018); six division championships (1996, 1997, 1999, 2000, 2009, 2018); and eight playoff appearances (1995-97, 1999, 2000, 2009, 2017, 2018). Missing, however, was the big prize — a coveted league title. That is, until the magical 2018 season. By the end of the 2018 training camp last winter, Wooten knew his team had talent, but the question was whether or not that talent could perform as a team. 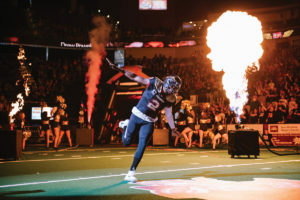 The Barnstormers began the season by posting a 3-1 record through the first four contests, its only loss coming to six-time defending champion Sioux Falls Storm. Ironically, it was a 43-32 road loss to the Nebraska Danger the following week that proved pivotal. “I knew (at that point) that we had a championship team,” Wooten said. Two weeks later, the Barnstormers turned the tables on Nebraska at Wells Fargo Arena in a 41-25 win, the first of seven straight victories. 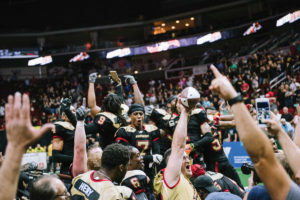 A 51-49 loss to the Storm put an end to the streak, but once again, a few weeks later, the team turned the tables, this time when it meant the most, as the Barnstormers claimed the IFL title with a thrilling 42-38 win in Des Moines. After dropping two games to the Storm during the regular season, beating them in the title game made it all that much sweeter. The team celebrated the victory, but Wooten and his staff began looking ahead toward 2019 almost immediately. Winning the title brings the bling — and a bull’s eye. The hunter has become the hunted. As do the players. The bar has been raised for them as well, Wooten said. As the win totals rise, so do the expectations. Preventing the latter means reloading the 2019 cupboard with the same top-tier talent as a year ago, beginning with finding a suitable replacement for quarterback, Drew Powell, who signed with the Saskatchewan Roughriders of the Canadian Football League (CFL) during the off-season. The 2018 IFL Most Valuable Player completed 154 of 226 passing attempts for 34 touchdowns a season ago, adding 23 rushing touchdowns en route to being named First Team All-IFL. The Barnstormers have signed quarterback Daquan Neal to fill the void, a 6-foot, 2-inch, 215-pound signal-caller who played collegiately at Elizabeth City State University. Last season, Neal appeared in one game with the High County Grizzlies of the American Arena League (AAL) where he rushed for 86 yards, two touchdowns and two 2-point conversions while throwing for 174 yards and five scores. During his senior season at Elizabeth City State University, Neal rushed for 684 yards while passing for 3,218 passing yards and 25 touchdowns. Wooten will once again lean heavily on wide receiver Ryan Balentine, defensive back Jourdan Wickliffe and defensive lineman B.J. Butler, all members of last season’s championship run. Wooten said the 6-foot, 1-inch, 180-pound Balentine, who played collegiately at the University of Southern Mississippi, was an integral part of the team’s success last year. Balentine had 58 receptions for 645 yards and 13 touchdowns a year ago and played a major role in the United Bowl Championship game with two first-half touchdowns: a 42-yard strike from Powell, and a 23-yard catch to paydirt later in the quarter. Balentine finished the game with five catches for 91 yards and three touchdowns, earning Most Valuable Player honors. Wickliffe anchored a solid secondary a season ago, finishing the regular season with 50.5 total tackles, 2.5 tackles for loss, three interceptions, six pass breakups, two forced fumbles, and two fumble recoveries in earning his place on Second Team All-IFL Defense. Defending champs or not, Wickliffe said he isn’t resting on last season’s laurels as he enters 2019. Butler (6 foot, 3 inches, 290 pounds, Louisville) joins the Barnstormers for his third season with the team. In 2018, Butler appeared in 13 regular season games with the Barnstormers, registering 26.5 total tackles, nine tackles for loss, one pass breakup and one sack. A big (literally) offseason signee was defensive lineman Izaah Burks, one of a number of newcomers to the 2019 roster. Burks (6 foot, 4 inches, 305 pounds) joins the team for his first season in the IFL after playing for Bowling Green State University where he appeared in 44 games and racked up 90 total tackles, 4.5 sacks and three passes defended. Following his collegiate career, Burks signed with the Green Bay Packers as an undrafted free agent. Burks spent the 2017 season on the Packers’ practice squad but was released following the season. Burks signed with the New York Giants prior to the 2018 NFL season but fell short on making the final roster. Another big catch was the landing of 6-foot, 6-inch, 225-pound wideout Connor Hollenbeck, who was previously with the Cedar Rapids Titans (newly re-named the Cedar Rapids River Kings). 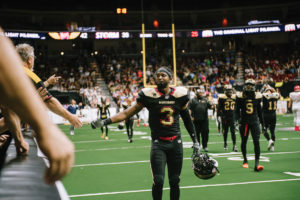 Hollenbeck appeared in a total of 28 games over two seasons, reeling in 101 receptions and 25 touchdowns and was named Second Team All-IFL Receiver in 2018. Change wasn’t limited to the field, as the Barnstormers have brought in a few fresh faces on the coaching staff as well. Rest assured, Wooten said, that while some names have changed, the attitude hasn’t. At the top of the food chain is Wooten himself, a man with seemingly nothing left to prove after helping guide his team to a title, and a two-year record of 26-6, including back-to-back 13-win seasons. Oh, and there’s the IFL Coach of the Year honors in 2017 and 2018. Through it all, his mantra for both he and his coaching staff remains the same. “We will work as hard as we can, not worry about what we can’t control, and stay humble,” he said. Chuck Miller joins the Barnstormers organization as the defensive coordinator and defensive line coach. Miller spent the past three seasons on the Green Bay Blizzard coaching staff as the offensive line coach and run game coordinator. Marshall Hart takes over as offensive line and special teams coach after having spent three seasons on the Nebraska Danger and Spokane Empire coaching staffs. One familiar face will be that of Jason Simpson, who will return as the defensive backs coach. Simpson spent six seasons as an Iowa Barnstormer player at defensive back before joining the coaching staff for the 2015 and 2016 seasons. As a player, Simpson currently holds team records for single-season interceptions (10), single-season combined kick return yards (1,723) and single-season kick return yards (1,711). Chemistry on the sideline is as important as it is on the field, Wooten said. On March 9, the Barnstormers and thousands of fans will be on hand to witness the unveiling of the 2018 championship banner, which will be unfurled and dropped from the rafters in its permanent hanging position. Wooten, for one, is looking forward to being a part of that special moment. Wickliffe said the team’s fan base is an integral part of their success. “The fans here are great,” Wickliffe added. “We had an amazing turnout for that championship game. That atmosphere was really something special to be a part of, and I think the city could feel that, and we’re looking to build off of that going into this season. 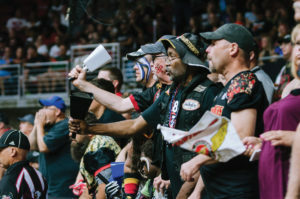 Season tickets for the Iowa Barnstormers 2019 season are on sale now for as low as $80 per seat. For more information, call 515-633-2255 or visit www.theiowabarnstormers.com. 3 Quad City Steamwheelers Taxslayer Center 3:05 p.m.
9 Green Bay Blizzard Wells Fargo Arena 7:05 p.m.
23 Nebraska Danger Heartland Events Center 7:05 p.m.
30 Cedar Rapids River Kings U.S. Cellular Center 7:05 p.m.
6 Cedar Rapids River Kings Wells Fargo Arena 7:05 p.m.
14 Bismarck Bucks Bismarck Events Center 2:05 p.m.
20 Sioux Falls Storm Denny Sanford Center 7:05 p.m.
27 Tucson Sugar Skulls Tucson Convention Center 8 p.m.
4 Cedar Rapids River Kings Wells Fargo Arena 7:05 p.m.
11 Quad City Steamwheelers Wells Fargo Arena 7:05 p.m.
19 Green Bay Blizzard Resch Center 3:05 p.m.
24 Bismarck Bucks Wells Fargo Arena 7:05 p.m.
8 Sioux Falls Storm Wells Fargo Arena 7:05 p.m.
15 Nebraska Danger Wells Fargo Arena 7:05 p.m. The IFL will expand to 10 teams this season with the addition of the Bismarck Bucks, Quad City Steamwheelers, Tucson Sugar Skulls and the San Diego Strike Force, who will join the Barnstormers, Arizona Rattlers, Cedar Rapids River Kings, Green Bay Blizzard, Nebraska Danger and Sioux Falls Storm. Each IFL team will play a 14-game schedule over 17 weeks. Each team will have three bye weeks.